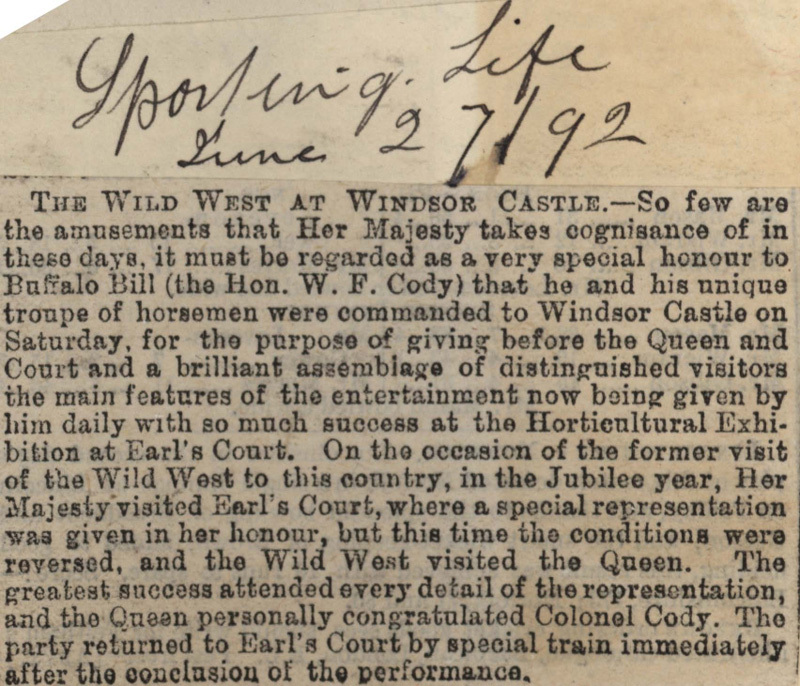 THE WILD WEST AT WINDSOR CASTLE.—So few are the amusements that Her Majesty takes cognisance of in these days, it must be regarded as a very special honour to Buffalo Bill (the Hon. 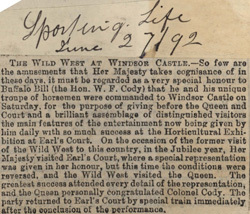 W. F. Cody) that he and his unique troupe of horsemen were commanded to Windsor Castle on Saturday, for the purpose of giving before the Queen and Court and a brilliant assemblage of distinguished visitors the main features of the entertainment now being given by him daily with so much success at the Horticultural Exhibition at Earl's Court. On the occasion of the former visit of the Wild West to this country, in the Jubilee year, Her Majesty visited Earl's Court, where a special representation was given in her honour, but this time the conditions were reversed, and the Wild West visited the Queen. The greatest success attended every detail of the representation, and the Queen personally congratulated Colonel Cody. The party returned to Earl's Court by special train immediately after the conclusion of the performance.